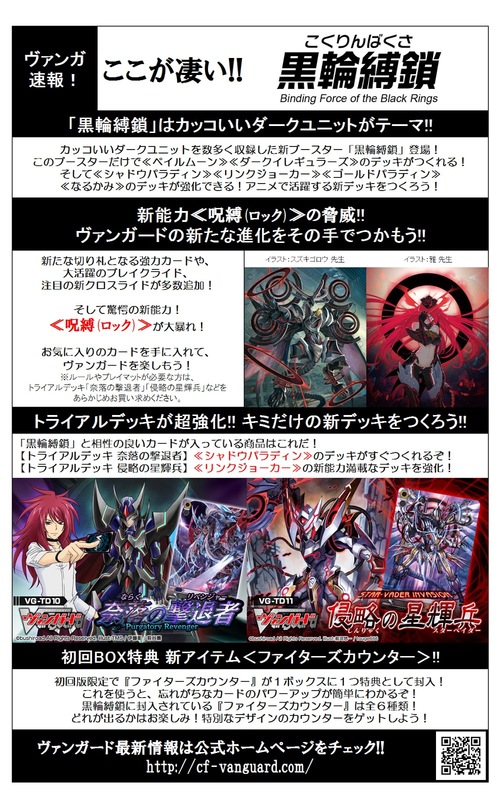 Cardfight Pro: News: VG-BT12: Binding Force of the Black Rings Unveiled, New Link Joker and Shadow Paladin Cards, Pale Moon, Dark Irregulars et al. News: VG-BT12: Binding Force of the Black Rings Unveiled, New Link Joker and Shadow Paladin Cards, Pale Moon, Dark Irregulars et al. 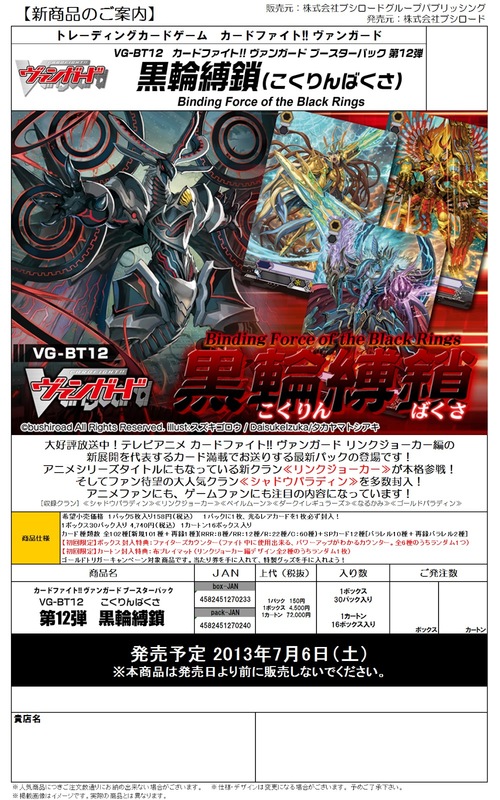 The set will contain 102 types of cards with 1 reprint, currently believed to be Blaster Dark Revenger from TD10: Purgatory Revenger. It will also support the Pale Moon, Dark Irregulars, Narukami and Gold Paladin clans. Careful scrutinizing of the promotional images reveals cards resembling Great Silver Wolf Garmore, Divine Seal Dragon Dungaree and Mad-Eye Basilisk. The Link Joker units have been noted to resemble existing units from other clans, so far with Blaster Blade on the cover image for TD11, Spectral Duke Dragon on one promotional image for BT12, and Silver Thorn Dragon Tamer, Luquier on the other promo image. Furthermore, the artists for these Link Joker units are the same as their originals, Suzukigorou and Masa.